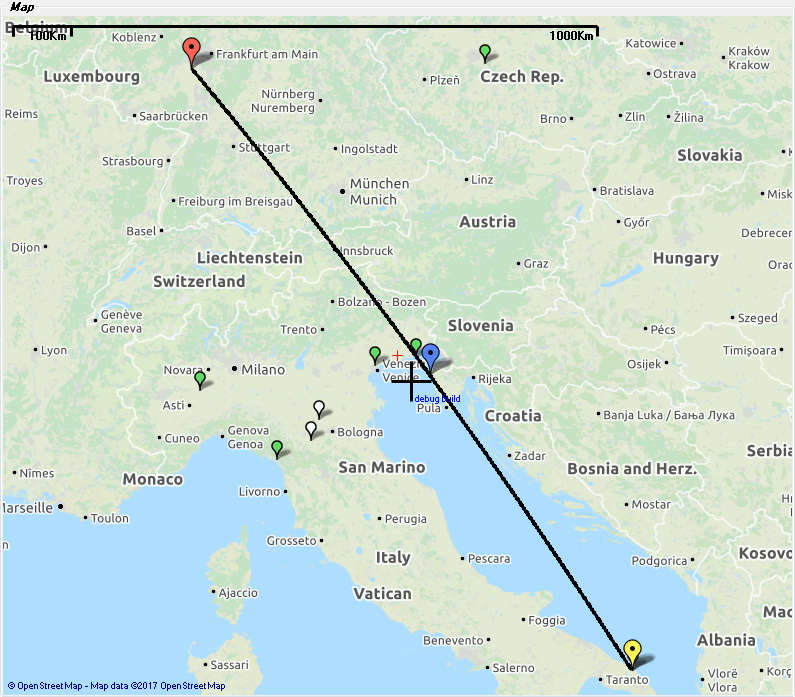 There was nice activity in JT9F on 23 cm tonight. It seems this mode works fine with aircraft scatter. 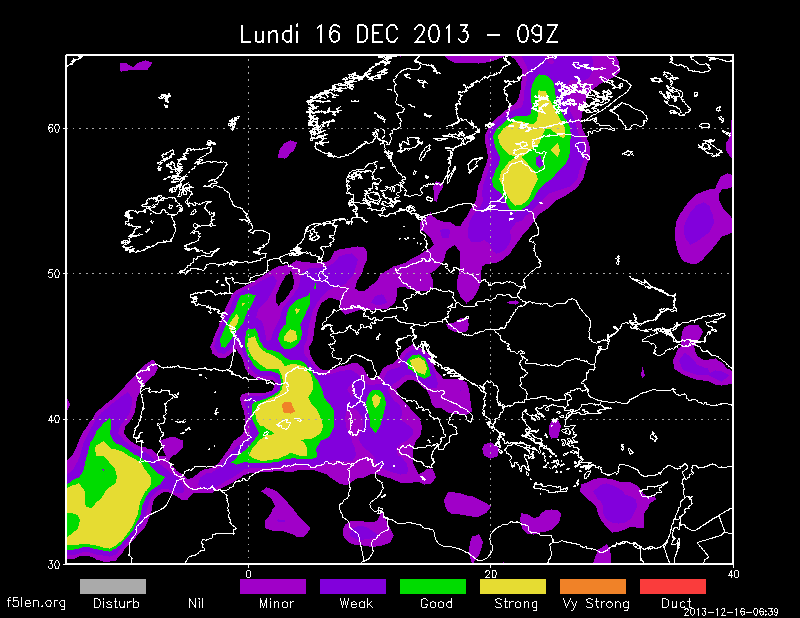 I first worked Conrad, PA5Y in JO21VO (255 km) and Sam, G4DDK in JO02VO (540 km) via Tropo. Then logged a QSO with Neil, G4BRK in IO91HP using mainly aircraft scatter. In another test I decoded Neil, G4DBN in IO93NR (756 km) by reflections on airplanes. PA0JME and ON5KTO were calling CQ, but not replying to my calls. Instead I worked John, G4BAO in JO02cg (619 km) in an (too) easy way. Worked stations in green, the heard ones in blue. Anyway, it was a promising and exiting evening! Yesterday I logged Rien, PA0JME, Wim, ON5KTO and John, G4ZTR, also in JT9F on 23 cm. Chatting with John, G4BAO, last night, I learned, he recently initiated a “Digifest” on the microwave bands every Wednesday. This resulted in what happened two days ago. In my opinion it´s a very good idea to have such an activity evening beside the regular contests. This entry was posted in Aircraft Scatter, Tropo, WSJT and tagged 1296 MHz, Aircraft scatter, Digifest, JT9F, Microwaves, Tropo, WSJT on 2017-10-25 by admin. Hopefully it will last for some hours! 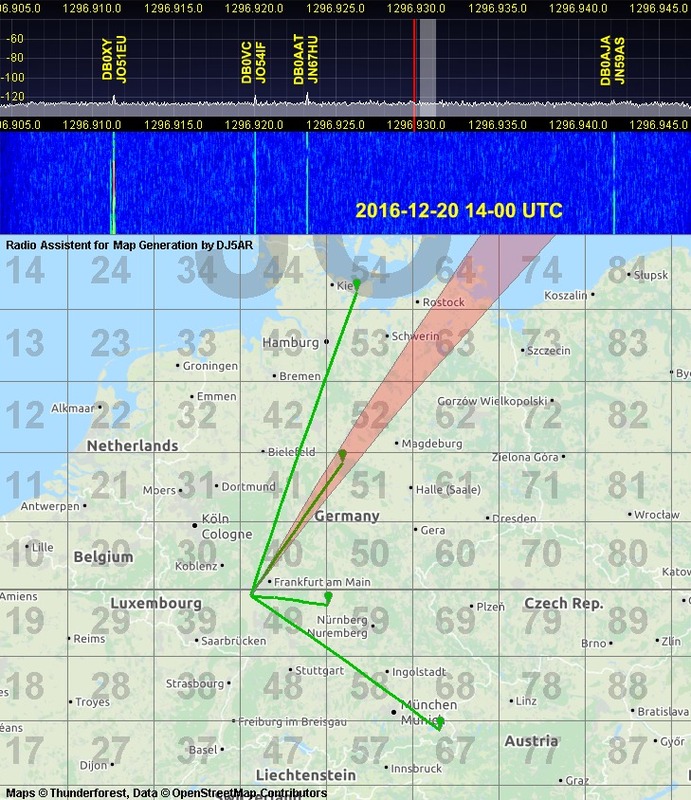 This entry was posted in Tropo and tagged 1296 MHz, 23 cm, beacons, Tropo on 2016-12-20 by admin. During the morning I was able to monitor GB3FM in IO91OF on 1297.050 MHz and G8MBU in IO90IR on 1296.800 MHz. Now in the afternoon F5ZCS in IN87PT on 1296.959 MHz came out of the noise with a strong signal of 549 with fast QSB. It is my 53rd beacon on 23 cm. 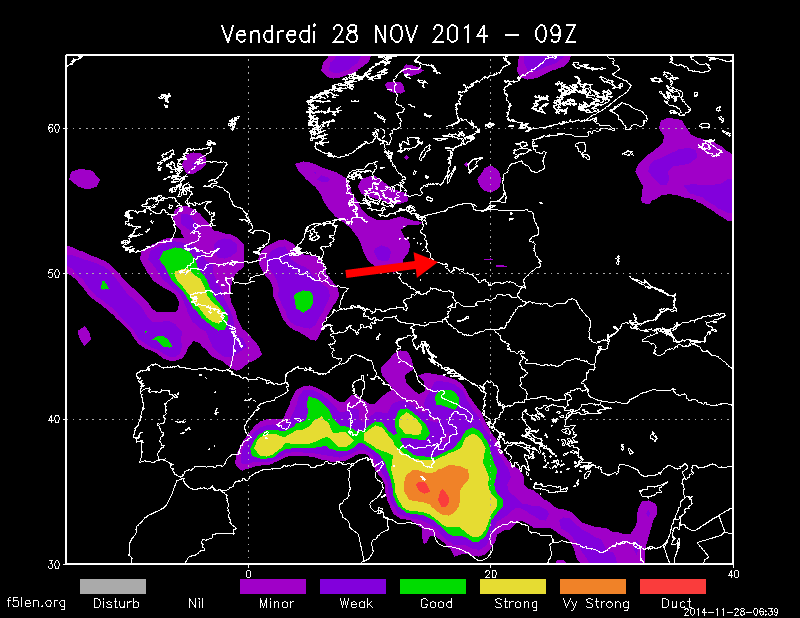 The weather here in Mainz doesn´t look like tropo: 8/8 cloudy and wind at 40 km/h. This entry was posted in Beacons, Tropo and tagged 1296 MHz, 23 cm, beacons, Inversion, Tropo on 2016-09-28 by admin. The first remarkable opening for quite a long time happened from 10th to 11th of February 2015. F5LENs refractive index forecast promised good conditions for these days. 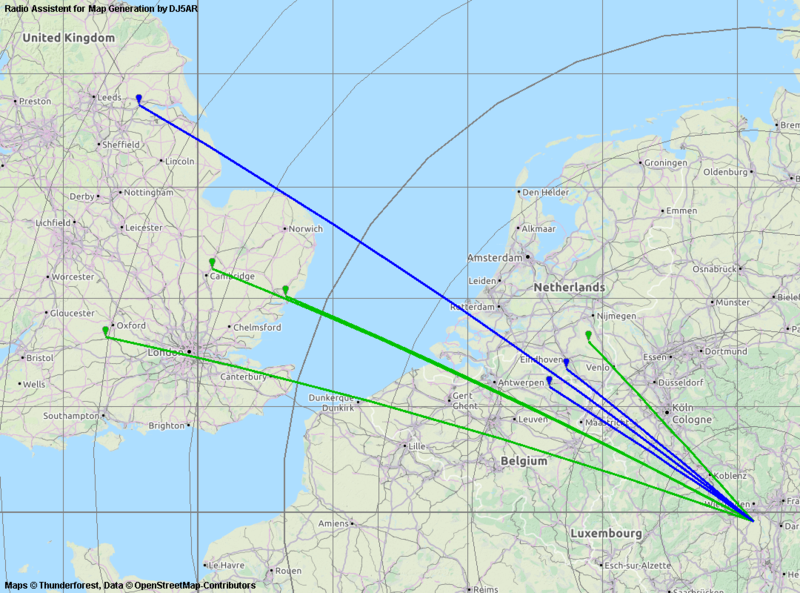 It started with some stations from G, appearing on 2 m. While the activity contests were going on in Scandinavia and the UK on 70 cm, a few operators dropped into the microwave chat. At least two new DXCCs could be worked before going to bed: Steward, GM4AFF in IO86TS and Gordon, GI6ATZ in IO74AJ as no. 30 and no. 31 on 23 cm. 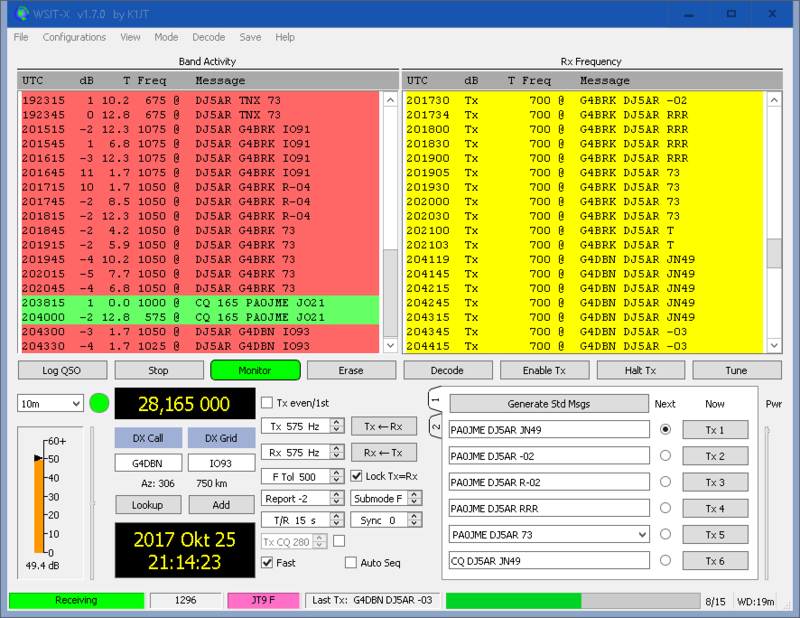 Only a few beacons could be heard via tropo: GB3FM in IO91OF, GB3MHZ in JO02PB, PI7ALK in JO22IP, OZ5SHF in JO45VX and OZ1UHF in JO57GH as a new one. In the morning the inversion had moved to the north-east and never before heard beacons from Sweden became audible on 23 cm. SK6UHI in JO57TX, SK6MHI in JO57TQ, SK6UHI in JO97CJ and SK4BX in JO79LI over 1138 km as my new beacon ODX appeared on the band. Many of the Swedish stations were as loud here as locals. Some of them could be worked on 13 cm as well. 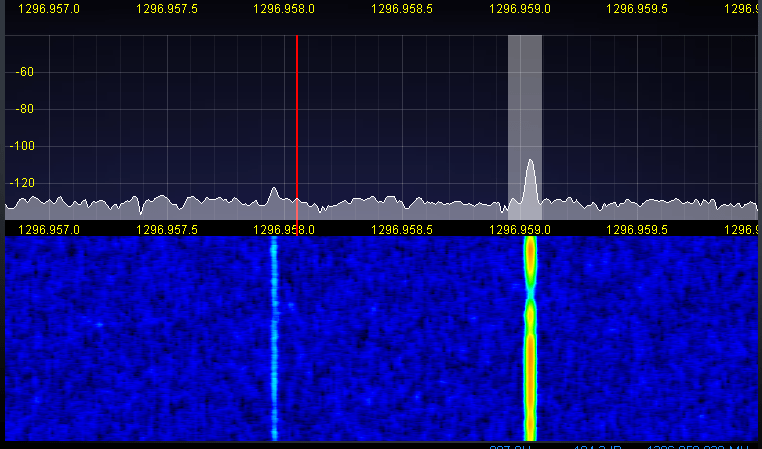 This entry was posted in Tropo and tagged 1296 MHz, 13 cm, 23 cm, 2320 MHz, Inversion, Microwaves, Tropo on 2015-02-12 by admin. There are good tropo conditions to the east from here for quite a while. I worked OK1MAC on November, 26th with an outstanding signal. OK0EA, SR6LHZ can be monitored constantly. I missed OK0EL on 1296.940, but solved the miracle today. The frequency shifted to .942 and the signal has been covered by DB0AJA. 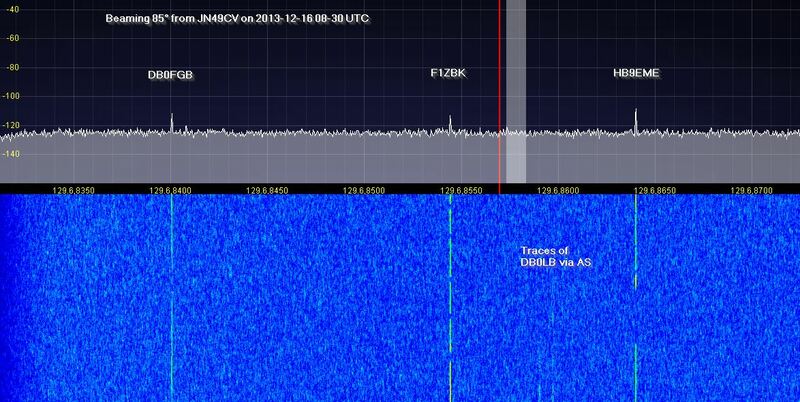 It´s nice to listen, how OK0EL in 526 km distance is battling against nearby DB0AJA,131 km away. 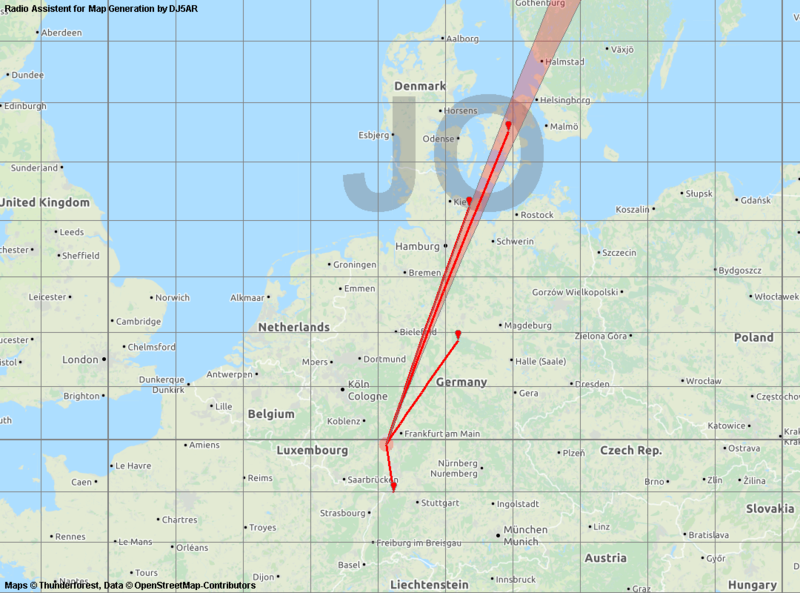 As can be seen, DB0AJAs signal is accompanied by several dopplershifted reflections on airplanes. It is interesting to see, that F5LENs refractive index as well as Hepburns tropo index don´t really illustrate the real conditions today. The conclusions is: Always perform a beacon check before switching off! The result may be surprising. This entry was posted in Beacons, Tropo and tagged 1296 MHz, 23 cm, beacons, DB0AJA, OK0EL, Tropo on 2014-11-28 by admin. While performing my beacon check on December 16th, 2013 at 8:30 UTC, I stated that all beacons seemed to be at a normal level. Except, when looking for DB0FGB (JO50WB) with the dish heading 85°. There was a constant carrier of about 20 dB 15 kHz up, keying F1ZBK (JN38BP). Expecting a big signal, I turned the dish to France. 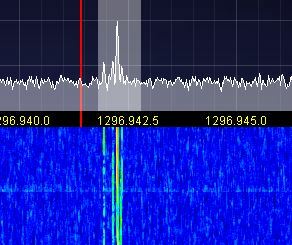 But the beacon was only 15 dB with QSB, when beaming directly to it at 228°. Then I turned the dish back to 85° and noticed, that HB9EME (JN37KB) joined the party. The rain radar didn´t show anything unusual and the F5LEN Refractive index forecast for Europe promised only marginal tropo conditions for this area. Only DL7QYs Condition Index for south Germany has been on a level of 7 (1 = poor; 10 = extreme). DB0FGB was a bit above normal at about 15 db with little QSB up and down. 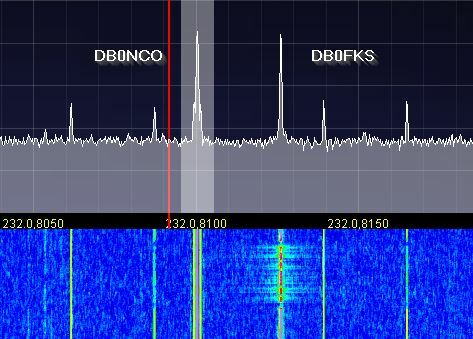 F1ZBK was constantly at 20 dB, when beaming 85° and around 15 dB with QSB heading 228° (direct). HB9EME was up to 20 dB in 85° and peaking 15 dB in fast QSB when beaming 198° (direct). I checked HB9BBD, F5ZBS, F1ZBI and others, but couldn´t see any similar effects. The angle was very small. When turning the 3 m dish 5° left or right, the signals disappeared. These conditions lasted for about one hour. The horizon in 85° is about 80 to 90 km off. A plausible explanation could be a strong troposheric duct between the beacons and a reflecting topographic formation. In issue 2/14 the german magazine “Funkamateur” published an article by Matthias Hornsteiner, DG4MHM “Prognosekarten für troposphärische Überreichweiten” (Prediction maps for troposheric ducting). Matthias explains the basics of ducting and analyses the models, the well known refractive index maps of F5LEN and W. Hepburn are basing on. So I had the intention, to ask him about a possibility for a reconstruction of the wheater constellation of that day. I have to thank him very much for his comprehensive answer. As Matthias explained, the situation, shown on the map, was quite common for this, as he describes it, “anti-winter”. But it holds the possibility, that warm air might glide onto cold air at ground level. And indeed, when he reviewed the data of weather balloons launched at Stuttgart on that day, he found indications for a strong inversion in an estimated level of 400 to 600 m over south Germany. That matches! In a distance of 200 km from here, the the topographic profile shows a formation, high enough to reach the level of this duct, as well as the mountains of the Fichtelgebirge do, where DB0FGB is located. The distances from Mainz to the area of the supposed reflection point is between 200 and 250 km. 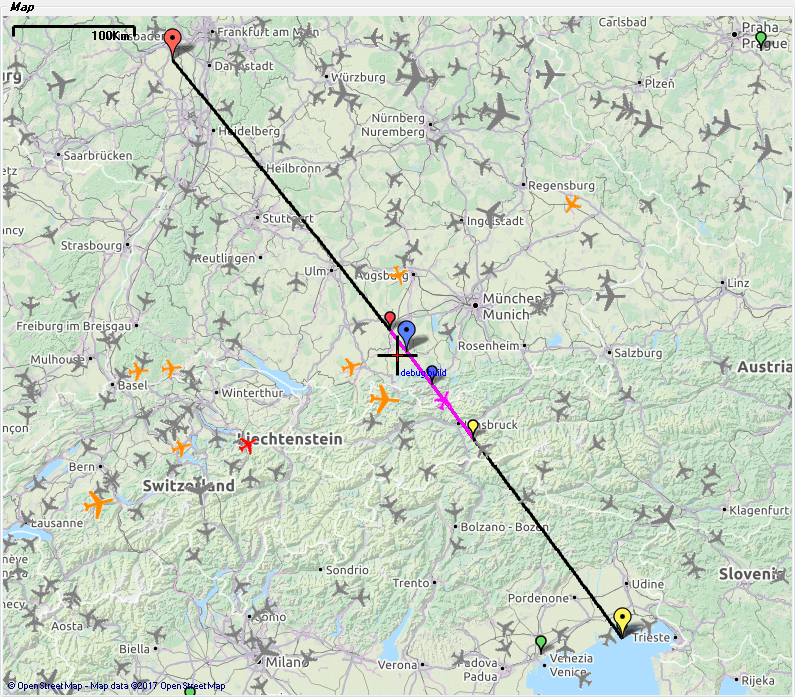 From F1ZBK and HB9EME it varies between 400 and 500 km. So the total path should have been between 600 and 750 km. This entry was posted in Beacons, Tropo and tagged 1296 MHz, 23 cm, Baken, beacons, dish, Inversion, Mainz, Microwaves, Parabolspiegel, Tropo on 2014-02-06 by admin. While looking for DB0AAT in JN67HU, DB0VC in JO54IF could be received too. 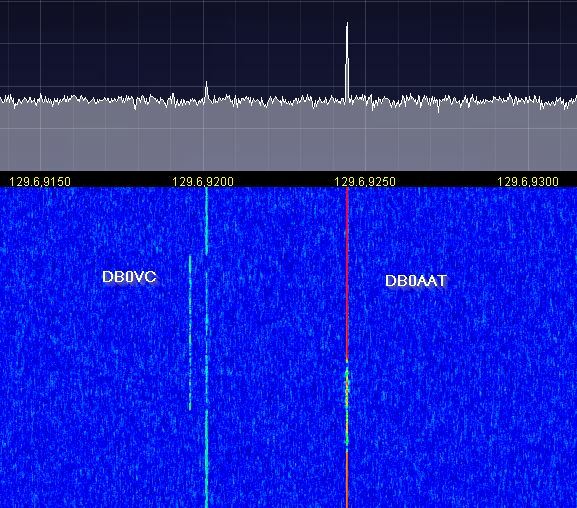 When beaming to Kiel, DB0VC can be heard even on 2320 MHz. It is beacon #9 on 13 cm. From my QTH DB0NCO has the same bearing as DB0FKS. The location of DB0FKS, the Frankenstein Castle, can be seen visually from here in a distance of 34 km. DB0NCO is 203 km away but tonight it is stronger than DB0FKS, when coming up in QSB. This entry was posted in Beacons, Tropo and tagged 1296 MHz, 13 cm, 23 cm, 2320 MHz, beacons, Inversion, Tropo on 2013-12-11 by admin.